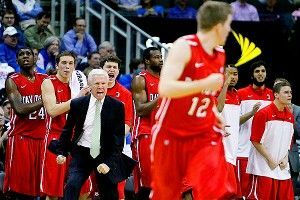 The NCAA tournament in March 2008 was so thrilling for us Davidson people, so consuming, so galvanizing, that it was next to impossible to not think grandiose thoughts. So now this is how it’s going to be. Davidson hasn’t been back since. The team the next year lost in the semifinals of the Southern Conference tournament, because that’s what sometimes happens, even with someone like Stephen Curry on the roster. The team the year after that won 16 games. Last year’s team won 18. The other day in the Charlotte Observer, longtime Davidson coach Bob McKillop quoted English poet Robert Browning. This year, the Wildcats had won 20 already by Saturday when they faced a very good Wichita State team in one of the weekend’s bracketbuster games. It was broadcast on ESPN2. It made me miss my school. then 20? That’s somehow more authentic. More instructive. Davidson’s run in retrospect is a reminder: It’s not about the ring. It’s about the reach. Chances come and go. The chase doesn’t stop.